• NEW: Instead of broadcasting full studio-recorded performances by the Featured Artists on Classical Minnesota Public Radio in March, as was our practice in previous years, we will feature excerpts from each Featured Artist recording during March 2019. Recorded excerpts will be presented by on-air hosts with accompanying biographical and recorded interview material. • NEW: The 2019 Minnesota Varsity Showcase Concert will be held on a Saturday instead of Sunday. The date is May 11, 2019, 3PM at Ted Mann Concert Hall. • Each Minnesota Varsity entrant, in every category, is eligible to receive either a voucher good for two tickets to a Minnesota Orchestra concert or two free tickets via online reservation to a Saint Paul Chamber Orchestra concert in the 2018-2019 season, while supplies last. While you may make requests, selection of the concert is ultimately on an "as available" basis and is determined by the respective orchestras. We reserve the right to substitute vouchers or tickets for different performances as available. Blackout dates and limitations may apply, as stated either on the vouchers, tickets, or in related online materials. All ticket-related questions must be directed to the Minnesota Orchestra or SPCO box offices. Can you provide a quick overview of this year's Minnesota Varsity? • Young musicians (instrumental and vocal) are invited to enter Minnesota Varsity by submitting their performance recording via an online entry process. (Be sure to read this year's rules first!) MPR staff will review all entries to determine a first round of finalists – 10 "Featured Artists". • Next, an MPR audio engineer will make professional recordings of the Featured Artists' performances in MPR's Maud Moon Weyerhaeuser Studio and help them sound their best. Excerpts from the recordings will be played on-air on Classical MPR, with accompanying biographical and recorded interview materials. • Finally, a panel of judges from Minnesota's classical music and musical theater scene will choose four "Showcase Artists," and an online Audience Vote will choose a fifth, to perform on stage in a live Minnesota Varsity show at Ted Mann Concert Hall on the University of Minnesota Twin Cities campus on Saturday, May 11, 2019. • This is the seventh year American Composers Forum is partnering with Classical MPR to adjudicate a Composer category. Young composers are invited to enter Minnesota Varsity by submitting the score of an original composition for violin, cello, and piano or any other combination of those instruments including a duet or a work for unaccompanied solo instrument. • NOTE: Minnesota Varsity is open to young music performers and composers who are able and available to complete all their responsibilities if selected as a Featured or Showcase Artist or a Featured or Showcase Composer. If, for any reason, you are unable to complete your responsibilities you must inform Minnesota Varsity at the time you are selected and Minnesota Varsity reserves the right to disqualify you and substitute another performer or composer. What are this year's entry categories? • Vocal soloist (with or without accompanist) performing Classical or Musical Theater. • Composer of an original, complete, and fully notated (no improvisation) musical composition of 3 to 7 minutes in length, scored for violin, cello, and piano, or for any duet combination from among those instruments (for example, violin and piano, violin and cello, cello and piano), or for solo violin, solo cello, or solo piano. No other instruments, doubling of instruments, electronics, or amplification may be used. For example, trios may not be written for violin and two cellos, nor for three violins, nor may duets be written for two pianos. What types of music can be performed? Classical Music means any music in the tradition of Western sacred and secular music from the 11th century to present times, and is not limited to music from the Classical Period from about 1750 to 1820 (only). "Musical Theater" means any music in the tradition of theatrical or motion picture music, and is not limited to music from Broadway musicals (only). How should I select a piece to perform? Our best advice is to choose a piece that you play well and feel confident about. Keep in mind that entrants who reach the Featured Round play the same work throughout the Minnesota Varsity season, and excerpts from all Featured Round studio recordings are going be broadcast. If you choose to submit a piece that you haven't mastered or is too virtuosic for your performance ability, your chance of being selected for the Featured Round will diminish. You're judged on the ability you demonstrate in the first recording you submit, not on your potential to have it ready by the time recording sessions begin. • North Dakota: Walsh, Grand Forks, Traill, Cass, Richland. • South Dakota: Roberts, Grant, Deuel, Codington, Brookings, Moody, Minnehaha. • Iowa: Lyon, Osceola, Dickinson, Emmet, Kossuth, Winnebago, Worth, Mitchell, Howard, Winneshiek. • Wisconsin: Vernon, LaCrosse, Trempealeau, Buffalo, Pepin, Pierce, St. Croix, Dunn, Polk, Burnet, Washburn, Douglas, Bayfield. • Michigan: Keweenaw, Houghton, Ontonagon, Baraga, Marquette. NOTE: If you have questions about the residence requirement, contact varsity@mpr.org for an eligibility evaluation. (a) 2018 Showcase ensemble members may enter Minnesota Varsity 2019 as soloists, or members of a different ensemble, but not as members of the same ensemble that was selected as the 2018 Showcase ensemble, and (b) 2018 Showcase soloists may enter Minnesota Varsity 2019 as ensemble members, but not as soloists. Instrumentalists and vocalists must be currently participating in a public or private school, religious or community music program. It's recommended that instrumental and vocal soloists' submitted recordings include an accompanist if the piece calls for it, but this is not required. If you need an accompanist, you must provide your own (of any age). INSTRUMENTALISTS AND VOCALISTS: Submit your completed entry form and your recorded performance online between 9:00 AM CT on Monday, September 17, 2018 and 9:00AM CT on Monday, December 3, 2018, OR send a CD or DVD and a completed entry form by mail to Minnesota Varsity, Classical MPR, 480 Cedar Street, St. Paul MN 55101. Your mailed entry must be postmarked on or before December 3, 2018. Note: the online submission form will not be available to print out after 9:00AM CT on Monday, December 3, 2018. COMPOSERS: Submit your completed entry form, and the fully notated score of one completed composition as a PDF file, online between 9:00 AM CT on Monday, September 17, 2018 and 9:00AM CT on Monday, December 3, 2018, OR send a printed copy of both by mail to Minnesota Varsity, Classical MPR, 480 Cedar Street, St. Paul MN 55101. Your mailed entry must be postmarked on or before December 3, 2018. Note: the online submission form will not be available to print out after 9:00AM CT on Monday, December 3, 2018. INSTRUMENTALISTS AND VOCALISTS: The entire recorded Submission, including the musical performances, may be up to ten (10) minutes in length. If a submission is longer than ten (10) minutes, then only the first ten (10) minutes will be considered. Note: If you are submitting one movement of a longer work, please excerpt and submit only that movement instead of submitting your recorded performance of the entire work. COMPOSERS: The Submission must be at least three (3) minutes in length, and may be up to seven (7) minutes in length. In order to help facilitate promotions and sorting of our submissions, we're asking you to identify your location. 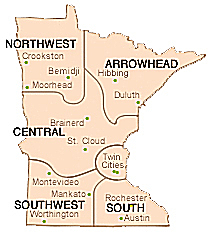 Within Minnesota, use this regional diagram. Location is used for promotional and other informational purposes only; it is not used as a judging criteria. Do I need to have a professional recording prepared for my submission? Your recording doesn't have to be high-tech or professional. You can use a smart phone to record the performance! Composers, you may submit an audio or video recording if you wish, but it is not required. See submission form for preferred formats. INSTRUMENTALISTS AND VOCALISTS: You will be judged solely on your musical performance based on criteria outlined in the official rules. MPR Classical staff will screen all the entries, and choose no more than 15 performances for the Featured Round. If you are chosen in the Featured Round, you will be recorded by a professional recording engineer who will help you sound your best. That recording will be played for a panel judges from the Minnesota classical music and musical theater world. The judges will choose the best performances for a live Showcase Concert at Ted Mann Concert Hall in Minneapolis. See the rules for more information. COMPOSERS: The score of your composition will be screened by a panel selected by American Composers Forum. Up to five composers will be chosen for the Featured Round. If you are chosen for the Featured Round, you will attend a Workshop Day on Feb.23, 2019 with Composer Edie Hill as your Mentor and a chamber ensemble from the University of Minnesota will perform your composition. A panel of ACF judges will select two Showcase Composers, whose works will be performed by the chamber ensemble at the Ted Mann Showcase Concert. That performance will be recorded. See the rules for more information. Can I submit as both as a soloist and an ensemble member? You can submit one performance as a vocal soloist and one performance as an instrumental soloist, plus you can participate in as many ensembles as you wish. However, each ensemble may submit only one entry (each). You may submit one composition as a composer. Also, you may enter in both the INSTRUMENTAL AND VOCAL and the COMPOSITION categories, but you will only be selected in one category if you make it into the Featured Round. Is the artist statement required? Yes, but it's only used as background information. You will not be judged upon the content of your statement. How will my artist statement be used? We may use it on the air, the web or at the Showcase Concert and in any other materials related to Minnesota Varsity. How do I write for violin, cello and piano? For advice on writing for these instruments, tutorial videos are available here. My birthday is coming up soon. Am I too old/young to enter? Entrants must be between ages 14-18 on May 11, 2019. For instance, a 19th birthday occurring prior to May 11, 2019 would make the entrant ineligible even if the Entrant was 18 when the entry was submitted. Similarly, a 14th birthday occurring prior to May 11, 2019 would make the entrant eligible even if the Entrant was 13 when the entry was submitted. How many entries will be selected in each round? Public voting in the Featured Round will be conducted between 9:00 AM CT on March 18, 2019 and 11:59 PM CT on March 24, 2019. The performer with the most votes at the end of that period will win a spot in the Showcase, bypassing the esteemed judges. Members of the public may cast one vote per person per email address. Subsequent votes from the same email address will be disqualified. IN THE SPIRIT OF FAIR PLAY, WE REQUEST THAT VOTERS LIMIT THEMSELVES TO "ONE PERSON, ONE VOTE" REGARDLESS OF ACCESS TO MULTIPLE EMAIL ACCOUNTS OR OTHER METHODS OF IMPACTING THE VOTING PROCESS. See official rules for more information. Each Minnesota Varsity entrant, in every category, is eligible to receive either a voucher good for two tickets to a Minnesota Orchestra concert or two free tickets via online reservation to a Saint Paul Chamber Orchestra concert in the 2018-2019 season, while supplies last. While you may make requests, selection of the concert is ultimately on an "as available" basis. The Minnesota Orchestra and Saint Paul Chamber Orchestra reserve the right to substitute vouchers or tickets for different performances at their discretion. Blackout dates and limitations may apply, as stated on the vouchers, tickets or in related materials. If you're chosen as a Featured Artist, you'll get to work with an audio engineer from MPR to produce a professional recording of your performance. Excerpts from your performance may also be broadcast on-air, streamed on the air and available from MPR and MPR Classical websites and social media sites. INSTRUMENTALISTS AND VOCALISTS: One free recording (on USB drive) of the MPR-prepared recording of their performance (retail value: approximately $500). COMPOSERS: One free recording (on USB drive) of the MPR-prepared recording of their composition (retail value: approximately $500), plus one complimentary yearlong student membership in ACF ($50 value). NOTE: The prize is awarded as a single prize to the Featured Artist. Except as noted, the prize does not increase if the Featured Artist is an ensemble with multiple members. The free recording will not be given to you until you have completed all your responsibilities as a Varsity Featured Artist or Composer as described in your contract. What is the purpose of Minnesota Varsity? The goal of Minnesota Varsity is not to single out the very best performers or composers in the state and its environs. Rather, it's to encourage young musicians to make music and to be involved in the process of creation with their peers. Minnesota Varsity helps to bring to the forefront the importance of music and arts education in this state and throughout the nation. I just can't find the answer to my question. What should I do? Try reading the rules and this FAQ one more time. Then ask another person to read the rules and this FAQ. We think you'll find the answer. But if you're still stumped, then contact us at varsity@mpr.org.